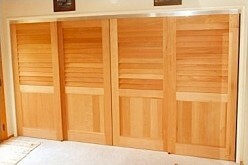 What If My Closet Openings Are Not Square? 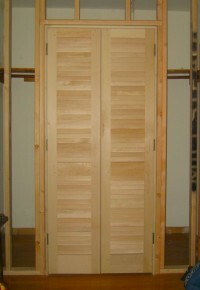 It is not uncommon to have the openings for interior doors or closet doors be out of square. The reasons could be anything from the house settling to an uneven floor to stud walls and header being twisted. The good news is that in most cases it is easy to work around these issues. The first thing you will want to do is measure the framed opening where you want your doors. It is a good idea to measure the width and height in a few different places. This will help to show you where, if at all, your framed opening is out of square. Another check is to measure diagonally across the opening. If the measurement from the top left corner to the bottom right corner is the same as the measurement from the bottom left corner to the top right corner then your framed opening is square. 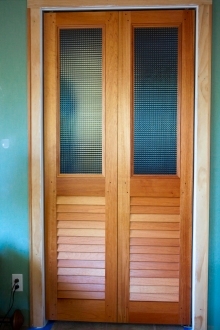 Here is a link to our site on How to Measure for Doors which will help. If you do find that your framed opening is not square there are ways to work around this. If you the header dips to one side or another, or if it has a “bump” in the middle there are a few things you can do. You can try and correct it be removing and re-installing the header. Most likely this will be more difficult and time consuming than the alternative. 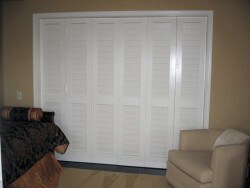 If you are installing sliding closet doors or bifold doors you can simply shim out the track to make it level. Any resulting gap can be easily covered with a valence or corner moulding. 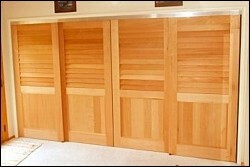 If you are installing hinged doors you have a choice. If the header only dips an 1/8″ or so you may just want to leave it be. However, if the gap is more noticeable you should consider removing the door casing and straightening the door jamb. If your floor is uneven there is not too much that you can do other than rip up and lay down a new floor. Thankfully an uneven floor will not affect the way your doors work. It will just mean that you have more of a gap at one end of the bottom than at the other. If your house has settled you will mostly likely find that the side jambs will not be plumb. You will treat this similar to how it was explained with the uneven header above; let it be if the gap is small or remove the casing and re-plumb the jamb. 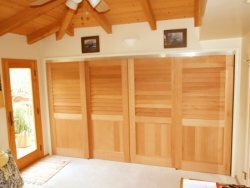 If you installing sliding closet doors or bifold doors the simplest thing to do is to let the gap stay and then apply a simple quarter round or corner moulding right in front of the doors along the side jambs. This will hide the gap and not interfere with the way the doors open and close. Hopefully this post has been helpful. If you still have questions on how to work with your non-square openings for your doors just ask. Give us a call, send us an email or start an online chat. We are happy to help.